(Nanowerk News) Researchers at Japan’s National Institute for Materials Science revealed that improvements should soon be expected in the manufacture of transistors that can be used, for example, to make flexible, paper-thin computer screens. The scientists reviewed the latest developments in research on photoactive organic field-effect transistors; devices that incorporate organic semi-conductors, amplify weak electronic signals, and either emit or receive light. Organic field-effect transistors (OFETs) were developed to produce low-cost, large-area electronics, such as printable and/or flexible electronic devices. The review was published in Science and Technology of Advanced Materials ("Recent progress in photoactive organic field-effect transistors"). The researchers reported that much progress has been made in the development of light-emitting organic field-effect transistors (LE-OFETs) since they first appeared in 2003. Research in this area has resulted in advances in the manufacture of novel organic photonics applications using cost-effective approaches. Light emission efficiency and brightness of these transistors will soon improve. 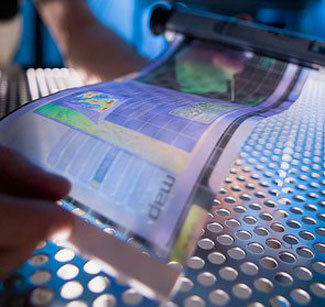 And the production of new display technologies is expected to be the result of further research. LE-OFETs are also expected to become fully compatible with well-established electronic technologies. This may allow further development of optical communication systems and optoelectronic systems, such as those using laser technologies. LE-OFETs are being used to develop, for example, flexible, transparent computer screens. These screens are purported to provide faster response times, better efficiency, and no need for backlighting. They also have very low energy needs. Light-receiving organic field-effect transistors (LR-OFETs), on the other hand, are much less developed than their light-emitting siblings. LR-OFETs convert light into electrical signals, opening a way to new optoelectronic devices. Phototransistors, used in CD players, are an example of such devices that hold much promise. But their durability needs to be improved for them to be used in more flexible applications. Further development is also required in other kinds of light-receiving OFETs before they can be used in all-plastic computing devices. Light-receiving organic field-effect transistors could open new frontiers for photonic and electronic devices. Flexible displays, in which all the device components – such as the light-emitting parts, the switching parts, and the substrates – consist of plastic materials have already been developed and will appear on the market in the near future. However, similar memory devices are still lacking. If “plastic memory” is developed, it will open a new frontier. The researchers found that the performance of devices that incorporate both light-emitting and light-receiving transistors faces several issues. They recommend interdisciplinary collaborations between organic chemists and device physicists for these issues to be resolved. They estimate that it will still be another ten years before all-plastic, flexible computing devices appear on the market.